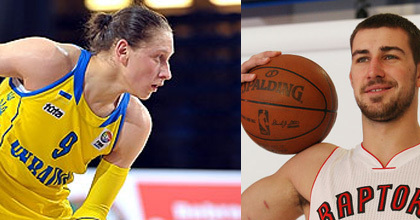 REGENSBURG (David Hein’s Eye on the Future) – FIBA Europe announced this week the winners of the Young Men and Women’s Players of the Year 2012 and they were right on with the selections of Jonas Valanciunas and Alina Iagupova. Valanciunas is actually a repeat winner of the men’s award after taking the 2011 honor following his leading Lithuania to the gold medal at the 2011 FIBA U19 World Championship title, having a strong role in his debut with the senior team at EuroBasket 2011 and getting drafted by the Toronto Raptors with the fifth overall pick. Jonas didn’t have too bad of an encore in 2012. Staying with Lietuvos Rytas during the NBAlockout, Valanciunas helped the Vilnius team to the finals of the Lithuanian League and Baltic League while also reaching the semi-finals of the VTB United League and Eurocup. On top of that, the 20-year-old became a full-fledged staple in the Lithuanian senior team, averaging 8 points and 4 rebounds during the Olympic Qualifying Tournament and then 4.2 points and 2 rebounds at the 2012 London Games. Valanciunas then headed to the United States for his NBA debut and began the 2012-13 season in the Raptors’ starting line-up, collecting a double-double of 12 points and 10 rebounds in his first NBA game. He later had double-doubles against Philadelphia and Charlotte as he averaged 9.0 points and 5.5 rebounds in November. His production slowed in December with 5.7 points and 4.5 rebounds before he broke his right ring finger on December 21, forcing him to miss the rest of 2012 and all of January 2013. But Valanciunas had already more than proved that he is an emerging force to be reckoned with at all levels. With the results based by voting by fans and experts, Valanciunas was the clear winner over second-placed Dario Saric of Croatia and third-placed Frenchman Leo Westermann, who was the leading vote-getter by the fans. The women’s voting was also right on as Ukrainian 20-year-old Alina Iagupova took first place ahead of Sweden’s Farhiya Abdi and Queralt Casas of Spain. Iagupova had a strong summer of 2012 by helping Ukraine qualify for the 2013 EuroBasket Women, finishing second behind Belarus in Group A. The Dnepropetrovsk native was Ukraine’s leading scorer (14.1 ppg) and rebounder (6.3 rpg) while adding 1.6 assists and 1.6 steals. In addition to a double-double against Israel, Iagupova also had 27 points, 4 rebounds and 5 steals against Hungary. But Iagupova’s performance hadn’t really come as a surprise as the name had long been known in youth women’s hoops after star youth national team performances dating back to 2009, when the wing player played both for both Ukraine’s U18s and U20s – as a 17-year-old. Iagupova starred at the U20 level each of the next two summers and in 2012 was finally among peers of age. And Iagupova dominated once again, leading the tournament in scoring (27.6 ppg) and assists (5.3 apg) and finishing third in rebounds (10.1 rpg) and steals (3.0 spg). Of course, that earned a spot in the All-Tournament Team though Ukraine slumped to seventh place – losing to Netherlands in the quarter-finals. One thing that would be interesting to see is what Iagupova can do internationally at the club level. After starting the 2012-13 season with Bar Regina-Basket of the Ukrainian Higher League, Iagupova moved to Elizabeth Basket of the same league. And it’s been nothing but dominance with eight of 13 games over 30 points in averaging 32.5 points, 7.5 rebounds, 4.8 assists and 2.6 steals. It would be good to see Iagupova make the move to a bigger club – at least a Eurocup Women side –in 2013 so more than just Ukrainian fans get a chance to see this star play.